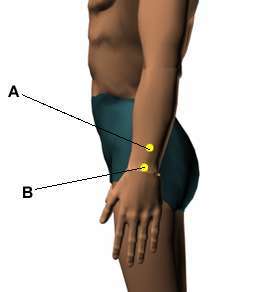 There are the acupressure points for relieving Wrist Pain. Working on these points can help you get better quicker. You do not have to use all of these points. Using just one or two of them whenever you have a free hand can be effective. 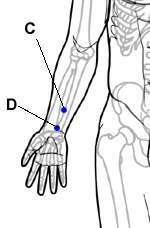 Location: On the outside of the forearm, midway between the two bones (radius and ulna), two and one-half finger widths below the wrist crease. Benefits: Relieves rheumatism, tendinitis, and wrist pain; increases resistance to colds. Location: Follow the outside of the arm to the hollow in the center of the wrist at the crease. Benefits: Relieves wrist tendinitis, rheumatism, pain when grasping, carpal tunnel syndrome, and wrist pain; also strengthens the wrist. Location: In the middle of the inner side of the forearm, two and one-half finger widths below the wrist crease. Benefits: Relieves nausea, anxiety, and wrist pain. Location: In the middle of the inside of the wrist crease. Benefits: Relieves wrist problems, such as carpal tunnel syndrome, rheumatism, and wrist tendinitis.